Turn usual photographs into exquisite pencil-drawn pictures. 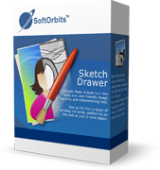 Sketch Drawer is a kind of photo editing software tool intended for converting photographs to pencil sketches. This program enables users to make usual photographs into exquisite pencil-drawn pictures, both black-and-white and colored. While creating a pencil sketch, you can choose your most preferred settings and options. There are two ways you can edit photographs with SoftOrbits: manually and by aid of ready-made presets. These presets can be used as guides by beginners. Purchase an Unlimited personal license (with support and updates) at 70% discount! 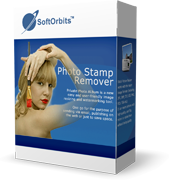 Photo Stamp Remover is a photo correction utility that can remove watermarks, date stamps and other unwanted objects that appear on photographs. Offering a fully automatic process, the program uses an intelligent restoration technology to fill the selected area with the texture generated from the pixels around the selection, so that the defect blends into the rest of the image naturally. What takes hours to correct using the clone tool, can be accomplished in a minute using Photo Stamp Remover. Purchase a personal license at 70% discount. 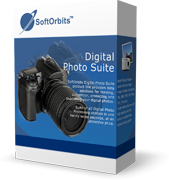 SoftOrbits Digital Photo Suite product line provides data solutions for retouching, resizing, converting, protecting and publishing your digital photos. Easy Photo Unblur improves the quality of camera shots by removing excessive noise and sharpening the blurred objects. There are many ways how to unblur a picture, and the most of them require professional skills in graphics editing. Easy Photo Unblur fits everyone regardless of skills in photography and design. The program helps to unblur a picture using artificial intelligence mechanisms. It is much more efficient than flat sharpening used in the most of alternative solutions. A user can preview the result and compare it with original photo before saving changes. Purchase a license at 70% discount. Provided without the GAOTD wrapper, so installed without needing to disable A/V software, and/or boot into safe mode - relief! Sketch Drawer is a perennial GAOTD package, and quite useful as a standalone product for those who don't have the like of Photoshop and a myriad of filter plugins. It is small, only 20mb or so, lighweight, and does exactly what it says; converts pictures to sketch drawings. The interface is clean, simple, and uncluttered. Images can be added via a basic selector or drag-and-drop. There is also a useful "previous" and "next" image buttons to 'scroll' through the images in a given folder. As far as I can tell, it is limited to importing standard image formats (jpg, bmp, gif png ico tif pga psd pcs wnf), although there is a "all files" option. I was unable to open a .psd file however. It comes with over a dozen pre-sets filters such as line-drawing, pastel, plastic, felt-tip, and each has numerous controls over stroke thickness, length, edge strength, intensity, and smudging, hatch edge strength, intensity, curvature and dispersion, stroke direction, type (curved or linear), and intensity, and 'colorize' histogram and colour shift. Once tweaked, an image can be saved in numerous formats; the usual jpg, bmp, png, gif, tif, but also many others such as pcx, ska, pcm, ico (nice for creating icons! ), and many I've never heard of such as cr2, 3fr. Even .raw format is supported. All-in-all, I estimated around 15 file export formats. Unlike another comment, I found that images saved opened up as the saved image, not the original. Perhaps a little user error and opened the original image by mistake? It does one job, and does it well. All in all, a great giveaway. Provided without the GAOTD wrapper, so installed without needing to disable A/V software, and/or boot into safe mode - relief! Sketch Drawer is a perennial GAOTD package, and quite useful as a standalone product for those who don't have the like of Photoshop and a myriad of filter plugins. It is small, only 20mb or so, lighweight, and does exactly what it says; converts pictures to sketch drawings. The interface is clean, simple, and uncluttered. Images can be added via a basic selector or drag-and-drop. There is also a useful "previous" and "next" image buttons to 'scroll' through the images in a given folder. As far as I can tell, it is limited to importing standard image formats (jpg, bmp, gif png ico tif pga psd pcs wnf), although there is a "all files" option. I was unable to open a .psd file however. It comes with over a dozen pre-sets filters such as line-drawing, pastel, plastic, felt-tip, and each has numerous controls over stroke thickness, length, edge strength, intensity, and smudging, hatch edge strength, intensity, curvature and dispersion, stroke direction, type (curved or linear), and intensity, and 'colorize' histogram and colour shift. Once tweaked, an image can be saved in numerous formats; the usual jpg, bmp, png, gif, tif, but also many others such as pcx, ska, pcm, ico (nice for creating icons! ), and many I've never heard of such as cr2, 3fr. Even .raw format is supported. All-in-all, I estimated around 15 file export formats. Unlike another comment, I found that images saved opened up as the saved image, not the original. Perhaps a little user error and opened the original image by mistake? It does one job, and does it well. All in all, a great giveaway. The registration process is even worse. you have to provide and Email to get the product, then provide it a second time to get the activation link, then open Email again to confirm Email and click link then it asks you to register your name, gender and other bio-data after which it send the link to your Email again and you have to open Email to click that link and it goes on forever! The registration process is even worse. you have to provide and Email to get the product, then provide it a second time to get the activation link, then open Email again to confirm Email and click link then it asks you to register your name, gender and other bio-data after which it send the link to your Email again and you have to open Email to click that link and it goes on forever! ouialaraison, I had a spontaneous de-registration issue. My November ...Giveaway... no longer works. ouialaraison, I had a spontaneous de-registration issue. My November ...Giveaway... no longer works. Johann Anton Oellers, I haven't installed today's giveaway as I too have the previous one, but it is my understanding that there is only one version. 2/ on the photo of the box, in both cases it says Sketch Drawer. And if you open the version you already have, you will see that on top right it says Sketch Drawer Pro but if you look in "about" it says Sketch Drawer. Incidentally, for those who are wondering: there is no more spontaneous deregistration issue with their products. Johann Anton Oellers, I haven't installed today's giveaway as I too have the previous one, but it is my understanding that there is only one version. Indeed, if you compare to day's and November page: 1/ the regular price is the same ($49.99) and the file size nearly equivalent (23.1MB vs 22.9 MB); 2/ on the photo of the box, in both cases it says Sketch Drawer. And if you open the version you already have, you will see that on top right it says Sketch Drawer Pro but if you look in "about" it says Sketch Drawer. They probably don't know themselves wether it is Pro or not. SoftOrbits have always been erratic anyhow... Incidentally, for those who are wondering: there is no more spontaneous deregistration issue with their products. If you do a google search for "free photo to pencil sketch converter" you will see "About 382,000 results (0.55 seconds) ". olrowdy01, have you ever thought that not all of these results are unique? and that they are not all programs? very wise. Also the speculations and assuming on your part makes your contribution of a comment worthless. Even alternativeto.net provides a lot of programs that aren't related to this in any way. olrowdy01, have you ever thought that not all of these results are unique? and that they are not all programs? very wise. Also the speculations and assuming on your part makes your contribution of a comment worthless. Even alternativeto.net provides a lot of programs that aren't related to this in any way.